I sit here thinking about the biggest challenges that I’ve had to overcome since starting my master’s at Memorial University. The transition to grad school from undergraduate wasn’t too bad: you’re doing more of what you love, but there are higher expectations. The transition is like moving from 3rd year to 4th in your undergrad. Instead, I’ve come to realize that the biggest challenge I’ve overcome has nothing to do with the university, but with the city’s weather. St. John’s, Newfoundland has terrible weather. It’s a gorgeous city filled to the brim with culture and unexpected delights, but the weather isn’t one of those delights. There is the odd day that’s beautiful and makes you want to stay outdoors as long as possible! But then there are the other days when you don’t want to go outside. During winter, I’ve encountered many days when I just don’t want to go outside because of the wind, rain, snow, or combination of all three. However, as we are students, we must still go outside and brave the elements for our education! And so, I will offer my advice for enduring Newfoundland’s strange weather. Be as water-proof as possible. I cannot stress this point enough: St. John’s is very wet. If it’s not raining, then there is a mist of water in the air. If there is no mist, then rain will inevitably pour. The day could start out clear and sunny, but it will turn into rain when you get out of class. I was shocked by how wet St. John’s is, but it’s easy to endure if you prepare. My most prized possessions are my leak-proof raincoat and my high-rise solid rubber boots. I never use an umbrella because the high winds will rip it from your hands or break it, so a raincoat with a good hood keeps me protected and dry. My boots may not be stylish, but they keep my feet warm and keep me from fearing rain puddles. I have two pairs: a casual pair of rain boots, and an insulated pair that I’ve been wearing for winter. I strongly suggest only investing in outerwear that is water-proof, otherwise you may be cold, wet, and regretting your purchase. Protect your devices from wet. As it rains a lot, you need to be ready for your things to get wet. If you’re walking to campus or between buildings, there is a good chance that you’ll get rained on and your backpack will get wet. If you want to completely avoid the chance of your books, laptop, or phone being ruined, I suggest investing in a backpack cover. Essentially, it’s a water-proof sack that fits over your backpack to guarantee your backpack and its contents will stay dry even on the rainiest of days. Second, I suggest a small dry-sac (a small bag that will keep its content dry even if submerged in water) to keep your phone in, or a plastic bag! A dry-sac or plastic bag with an extra pair of dry socks is a good idea to keep in your backpack at all times: nothing is worse than going through your day of classes with wet socks. Be as wind-proof as possible. St. John’s is the windiest city in all of Canada – isn’t that great? It’s not unusual for winds to reach 100 km/h here, so be prepared for some windy walks. Here, a good raincoat or leather/pleather jacket comes in handy. They will block out the wind, no matter how harsh, and keep you warm. A fluffy jacket that the wind cuts through won’t do you well for staying warm on a windy day in St. John’s. Invest in good boots. First, you need rain boots. My rubber boots have saved me from cold, wet feet too many times to count. I wear them nearly every day! But aside from rubber boots, it would be wise to invest in some hiking boots because there are so many beautiful hiking trails around St. John’s! Even if sub-optimal weather, hiking is one of my favourite things to do on the weekends. Without hiking boots, hiking trails are less enjoyable because they’re often laid with sharp, angular rocks. Although the hiking trail is worth it for the sights, your feet will be exhausted without proper hiking boots. They’re well worth the investment if you enjoy exploring nature and taking advantage of Newfoundland’s geography! Dress warm. To my surprise, St. John’s doesn’t get very cold in the winter – it hovers around 0 degrees Celsius, give or take 5 degrees. However, when you combine the cold with intense wind and wet, you’re in for a chilly time! A couple good pairs of thick socks will help to keep your feet warm, and they’ll last long too. Wool socks are the best for keeping you warm, even if they get damp. Along those lines, I highly suggest investing in a wool sweater. They may be more expensive than a cloth sweater, but wool will keep you warm even if it gets wet. A wool sweater under your rain coat will keep you cozy on a cold winter day, and wool sweaters (especially cream-coloured, cable-knit ones) are pretty stylish. A high-quality wool sweater will last for many years to come and always keep you warm. Personally, I have at least 6 wool sweaters that I’ve been rotating between for the winter. I wear a thin sweater, wool sweater, and my rain coat for the winter and I’ve always been cozy. Most of my sweaters are home-made and twice as old as I am: wool lasts. Keep cozy at home. This is my last piece of advice, and it’s important. Although you might follow my advice above to stay dry and warm, you will still feel the cold of St. John’s in your core after getting home. I’ve found it so important to take my time to warm up after getting home to keep yourself from catching a cold. Everyone keeps cozy in their own way, so I suggest finding out what works best for you! Some people like taking bathes, cuddling in blankets, wearing fuzzy socks or slippers, sweat pants, or lighting candles. Personally, I like to don a big sweater and fuzzy socks whenever I get home. It helps to warm me up after a cold walk, and it also makes me feel cozier during the winter. Honestly, the most important weather-related lesson I’ve learned is that you need to stay dry and stay warm in order to live in St. John’s. Once you’ve managed to do that, the rest of life here gets easier and more manageable. It’s also well-worth the bad weather, especially if you love nature. I’ve never been so happy as when I’m looking out at the ocean after hiking a path up to a cliff just outside of St. John’s. 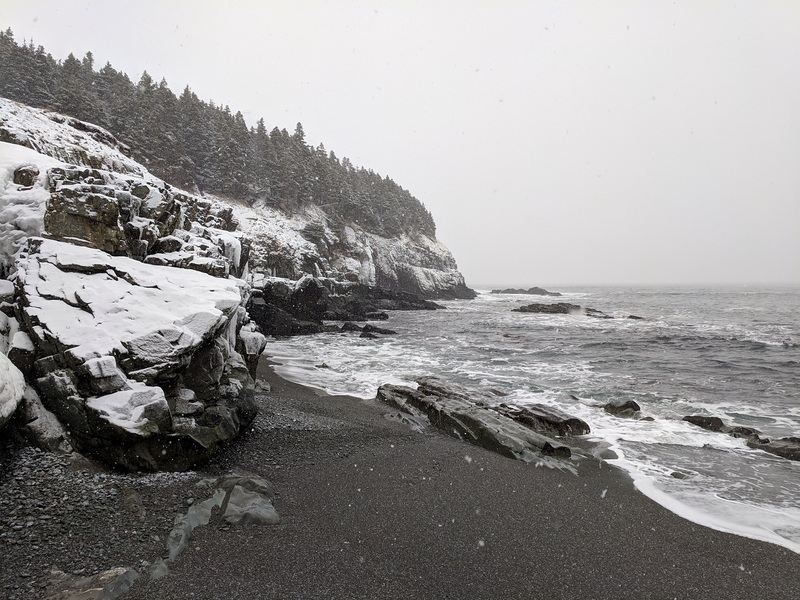 I went on a winter trip to Middle Cove Beach the other day with a friend, and even though it was cold and windy, I had an amazing time. The frozen beach was beautiful and the sight of it was worth cold hands and wind blowing in my face. 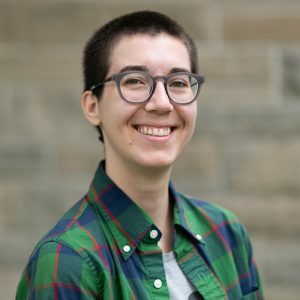 Shannon Pearson is from Conestogo, Ontario, Canada and is completing a Master of Arts in Sociology.